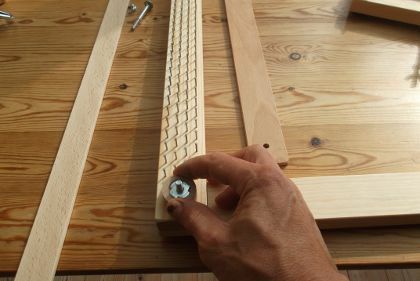 A weaving frame is a wooden frame, with nails on two opposite sides. 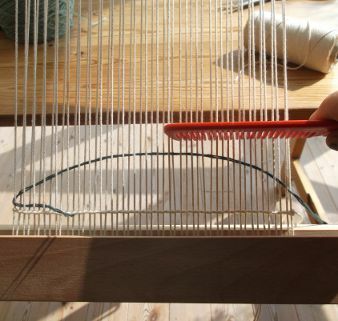 You can then tension warp threads from one side to the other and back. 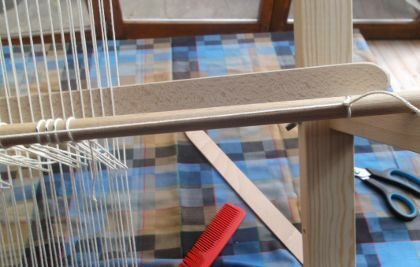 In this way, you can start weaving quickly, as opposed to weaving on a loom, where is a lot of preparing work. But weaving is slower on a frame. 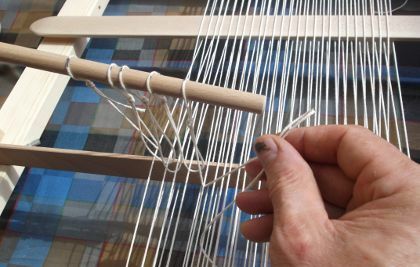 You have to move the weft thread up and down between the warp threads. picks will go quickly. 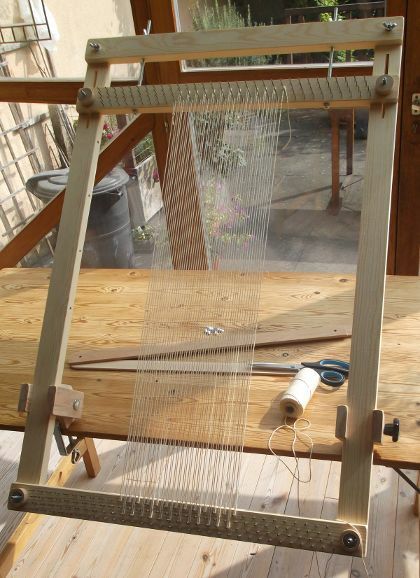 For the other picks, you can have advantage of a heddle stick. 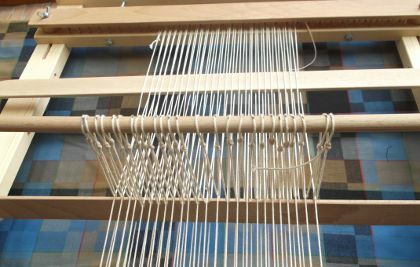 The heddle stick is a stick with loops, which can pull up the odd threads. 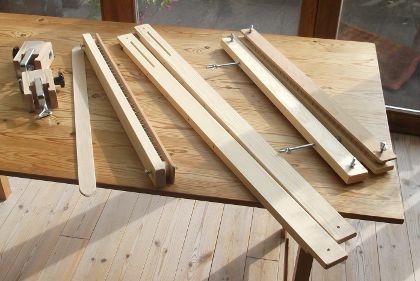 Mounting the heddle sticks needs additional preparatory work. 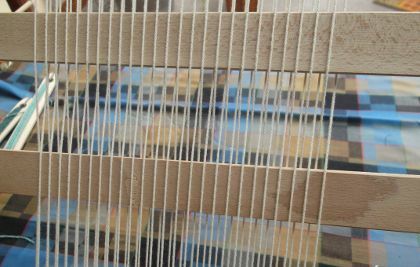 tension of the warp threads during weaving. 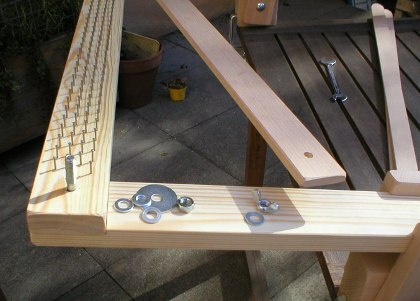 The weaving frames have on two opposite sides 2, 3 or 4 rows of stainless steel nails. 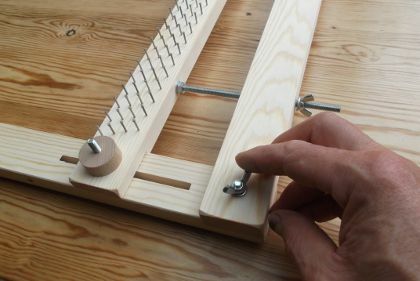 You can use all nails, or you can skip some nails, for different umber of threads the cm. With the frame with 5 nails for 2 cm, you can have maximum 5 warp threads the cm. height and angle that suits you. of the frame in the wood. 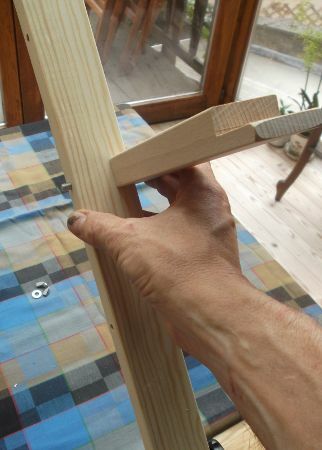 Mounting a frame of 50 cm. Mounting a frame of 70 cm. Put the warp on the frame. 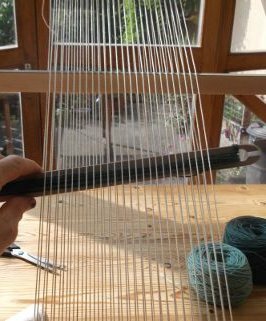 Use all nails or skip some, depending on the density of the warp threads you want. Put the protection strips in place and tight the wingnuts. 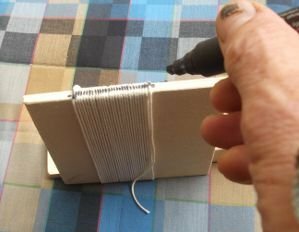 Optionally you can make a skeining thread with cabled cotton. This gives a nice finish and a regular spacing between the threads. 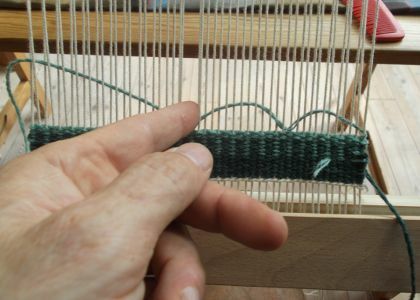 Insert the shed bar between the warp threads: odd threads under, pare threads above the bar. 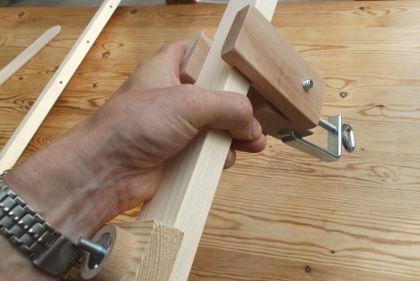 straight, but make little arches to avoid draw-in. Beat the weft thread against the previous pick. For the second pick you have to do the opposite:pare threads under, odd threads above. 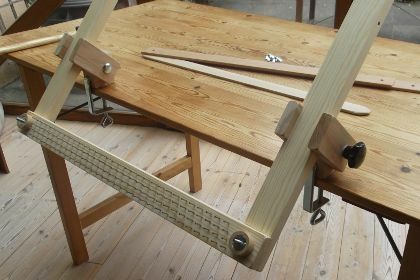 How to mount the heddle stick. First, mount the holders on both sides. 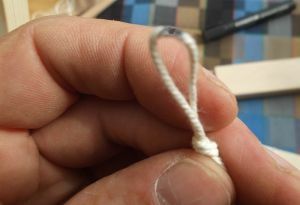 Wrap a thin rope (cabled cotton) around a board with a circumference of about 24 cm. and make a loop. You need as many loops as half the warp threads + 1. 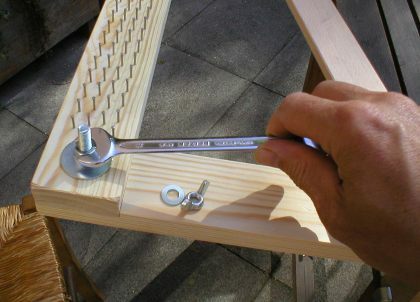 Use a second bar to force the odd threads upwards. 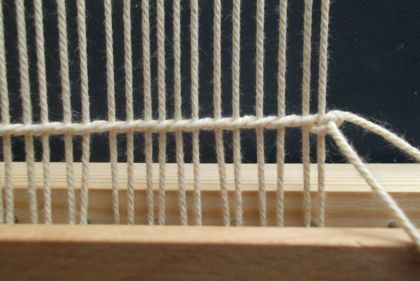 The warp threads cross each other between the two bars. 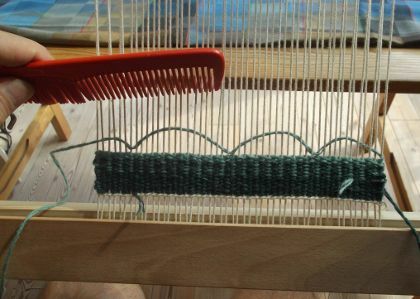 loop on the heddle stick.Collect the loops between each odd warp thread and put them on the stick. on the 2 ends of the stick.